On a beautiful if challenging day of yacht racing, with gentle easterly breezes that never topped 12 knots, a diverse fleet of 202 yachts -including nearly three dozen multihulls (one of the largest gatherings of catamarans and trimarans ever assembled for a Caribbean regatta) set sail on the opening round of the 33rd St Maarten Heineken Regatta. Despite winds mostly hovering around 6-8 knots, Principal Race Officer David Campbell-James made the gutsy call to send the A fleet, consisting of the eight CSA racing classes, as well as the Multihull 1 and 2 divisions, on the traditional round-the-island contest that launches the three-day regatta. Both multihull classes and CSA 1 (consisting of seven grand prix monohulls), sailed the 32 mile course that included a rounding of the small island of Tintamarre off the northeast corner of St Maarten. The remaining CSA 2-8 classes sailed a slightly abbreviated 29 mile course with a mark set inside of Tintamarre. 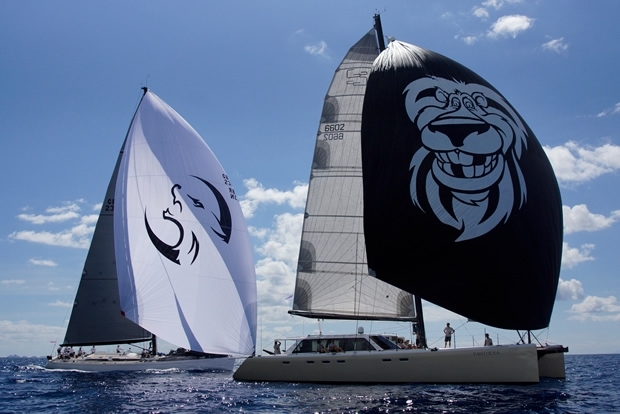 On the B circle comprised of the five Bareboat classes, the Lottery Division, and Multihulls 3, 4 and 5, the fleet sailed a 17 mile course along the southern and eastern shores of St Maarten. All the races concluded at a finish line in Great Bay off Philipsburg. Before the action got underway, long term St Maarten racer Bobby Velasquez, skipper of the 45ft Beneteau L'Esperance was asked what the weather gods had in store. He looked to the sky and replied, "Very light. Very fluky." He turned out to be a prophet. But the light winds hardly mattered to the first class to get underway - Multihull 1, composed of a quintet of Gunboat catamarans, returning to the St. Maarten Heineken Regatta in force after a brief hiatus. Talent-wise, the Gunboat contingent was stacked with world-class sailors, including Tornado champion and Caribbean cat legend Randy West (Tribe), J/24 champ and multihull expert Paul Van Dyke (Tiger Lily), A-Class cat champion Bob Hodges (Coco de Mer), and even Gunboat founder Peter Johnstone (Panthera). However, it was the team aboard the distinctive Gunboat, Elvis, that led the way on the clockwise course around St Maarten. After a short beat to windward, the crew that included Scott Bradford - the well-known former captain of Tom Hill's Titan maxis - and St Thomas-born professional sailor Anthony Kotoun, were able to bear off for the point at Basse Terre under a spinnaker emblazoned with a silhouette of 'the King'. Figuratively speaking, Elvis had left the building. Slicing atop the seas like water bugs, the cats and tris made good progress despite the light airs. But there were many memorable sights on the brilliant blue waters off St Maarten, including the salty Luders yawl Frolic, resplendent in a colorful mizzen spinnaker; former multihull sailor Philip Walwyn's classic gaff-rigger Kate, sliding upwind with triple headsails and a crewman stretched out on the bowsprit; and the fleet's smallest boat, the 21ft, home-built, hard-chine Muscadet Mini, Liberte, complete with self-steering vane. Young skipper Dimitri Brouhns, who spent 65 days sailing from Belgium to the islands to compete in the St Maarten Heineken Regatta, was so enthused by a passing photo boat that he stopped to take a swig directly from his rum bottle soon after the start. Asked if he was enjoying the racing, Brouhns replied, "I hope so!" He certainly appeared to be. After rounding Basse Terre at the western corner of St Maarten, the round the island racers embarked on a long beat up the west coast past Marigot and Grand Case. While many boats tacked across the Anguilla Channel in hopes of better breeze, by staying inshore several local sailors found flat water and steady wind flowing off the hills near the beach, where they made impressive gains. Once past Tintamarre, in fading winds, it was a tight reach to the finish line and the conclusion of the opening day of St Maarten Heineken Regatta. When the preliminary scores were tallied, a long roster of worthy winners topped the respective leader boards. In CSA 1, Jan Rupert's handsome Tripp 75 Blackbird was leader of the seven-boat class and also the fastest spinnaker flying yacht around the island, some 57 seconds under four hours. In CSA 2, Nico Cortlever's well-sailed X-612 Nix held an impressive lead in the early going, was the first boat to round the inside mark off Tintamarre, and held off her competition in the second half of the race to earn the victory in the 12-boat division. Nix was also the fastest 'non-spinnaker' boat to circumnavigate St Maarten, with an elapsed time of 4h 53m 25s. In CSA 3 - with 15 entrants, the regatta's biggest class - Patrick Holloran's Beneteau First 40.7 Caipirinha stood atop the fleet. Han de Bruyn Kips Hanse 47 TeamHan was the best boat in CSA 4. Bobby Valesquez used the light and fluky conditions well and rode them to victory with L'Esperance in CSA 5. Thomas Mullen's J/95 Shamrock VII employed the luck of the Irish to win CSA 6. Roger Petit's Bel Aurora won CSA 7, as did Mark Plaxton and Team INTAC in CSA 8. And the Melges 24 winner was head of the steering committee for the St. Maarten Heineken Regatta, John Gifford, aboard AMCON. Among the multihulls, aside from Elvis' victory in Multihull 1, in Multihull 2, the fastest multi around the island was Nils Erickson's Formula 40 Soma, with a time of 4h 34m 22s. However, when handicap times were applied Richard Woodridge's venerable Triple Jack earned top marks in the class. Multihull 3 was won by Petr Kochnev's Lagoon 500 Belisama. Maas Hanen's Outremer Teora was best among Multihull 4 contestants, while Dominique Cauchy took Multihull 5 aboard his Multi 23 Hii. In the Bareboat charter fleets, the winning boats were Famed 3 (Bareboat 1), Y-Not (Bareboat 2), Team Yacht Club Wamel Mohne (Bareboat 3), Syrena (Bareboat 4), and KHS&S (Bareboat 5). The Lottery Class winner was Canadian Marc Perron's Jeanneau Sunfast 43, Grosloup.